Simangele is dedicated to the advancement of the education of disabled students through the inclusion of creativity and the arts. She is also passionate about empowering teachers in their quest of providing equitable, just and socially relevant education to students in an ever changing society. Her involvement in Deaf Education came by chance. In her final year of high school, four Deaf girls enrolled in her school and offered interested students the opportunity to learn basic South African Sign Language after school to facilitate better communication with them. Those brief lessons greatly influenced the direction of Simangele’s life, as she went on to study South African Sign Language and Deaf Culture Studies as an accompaniment to her BA in Dramatic Arts at the University of the Witwatersrand, South Africa. During this time, she also volunteered with Deaf Television (DeafTV) as a trainee interpreter. Simangele’s dismay over the reality of high levels of illiteracy amongst the Deaf community and the need for advocacy surrounding the access to equal education for Deaf children led to her passion for both drama and education. After graduation, she spent a year as a special needs youth worker in Vancouver, B.C., where she investigated different methodologies of teaching special needs youth. Returning to South Africa in 2007, Simangele enrolled in a Masters of Arts in Dramatic Arts with a focus on Applied Drama and Theatre and volunteered as an English tutor at a local school for the Deaf and interpreter at the Deaf Federation of South Africa (AEAFSA). There, she was first introduced to the Visual Theatre company From the Hip: Khulumakahle (FTH:K) , South Africa’s premier theatre company that works with both Deaf and hearing actors. She used FTH:K for a case study on the use of theatre techniques to devise a collective dialogue between Deaf and hearing performers. In 2008, she was selected for a Mandela Rhodes Scholarship (MRS), awarded for a demonstrated commitment to the principles of Reconciliation, Education, Entrepreneurship and Leadership, and met other like minded and passionate young African leaders making tangible change in Africa. After completing her studies, Simangele worked as an advocate for arts education for disadvantaged learners, and after reconnecting with FTH:K, she joined the company as the Education Coordinator, designing and scheduling the flagship Tell-Tale Signs Program. The four-tiered Tell-Tale Signs Program has already won two awards for its work in empowering the Deaf and as a model of integration within the field of Arts and Culture in South Africa. Simangele is a member of the Community of Mandela Rhodes Scholars (CMRS), an alumni organization of the Mandela Rhodes Scholars where she serves as the regional coordinator and Projects Officer of the Executive Committee. In addition to the MRS, Simangele has received numerous awards including being named one of the Top 200 Young South Africans by the Mail & Guardian national newspaper in 2009 and 2010. Simangele collects coins, reads, swims, watches cinema and is currently succeeding in having as much grace (and fun!) as possible on the dance floor while learning to dance the salsa, where she will often be found a few times in the week. She also relishes in the opportunities she has had to dance with other salsa enthusiast Sauvé Fellows. 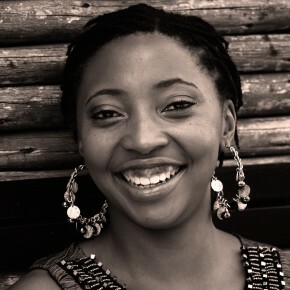 As her Sauvé Scholar project, Simangele worked to further the findings of her Master’s Research project, which highlighted the innovative use of play and non-linguistic devices in the creation of theatre performances that were accessible to integrated audiences of both Deaf and hearing people. She investigated the use of the performing arts in literacy education for Deaf students. At the same time, she gained insight into the broader framework of education theory and policy. Specifically, she developped strategies to advocate for a radical change in Deaf Education in South Africa, where arts education plays a role in the holistic education of Deaf students. As a result of her Sauvé project, Simangele launched the WordPlay Symposium, which brought community artists and educators in Montreal to Sauvé House to collaborate and share creative ways to teach literacy to special needs students. In addition, she compiled and edited the WordPlay Each One Teach One Zine, recording the various innovative teaching practices shared between community artists and educators. Simangele’s Sauvé project allowed her to further refine her skills as a special needs arts educator. During her time as a Sauvé Scholar, Simangele’s MA Thesis, Playing for Change: Investigating theatre devising for collective dialogue between Deaf and hearing performers, was published.